The Mercury in Sagittarius people are full of life and always ready to learn and try out something new. Sagittarius is usually quite optimistic, and the enthusiasm of Mercury in Sagittarius is downright infectious. They love a good education and plenty of good discussions. They are resolute in their convictions. Philosophy is their strong suit. They have a knack for seeing the bigger picture when others may not. Mercury is the planet of communication, logic, practicality and deep thought which makes Mercury in Sagittarius great orators. They appreciate knowledge in a way that makes them thirsty for more. This creates an endless cycle of learning throughout their lives. But be careful not to fence them in. They must have the freedom to research, think and discuss in whatever way suits them best. The creativity of the Sagittarius Mercury people flows most through wide channels and open spaces, even if it means missing a detail or ten. They don’t have a sharp focus on the smaller items. For them, it’s all about the greater outlook on life and its meaning. They love a good argument, as long as you don’t try to prove them wrong. 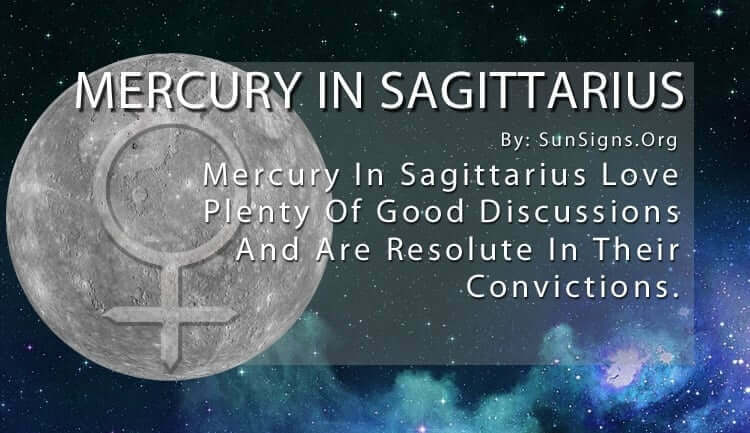 Even though they are happy and fun-loving, Mercury in Sagittarius takes their beliefs very seriously. They will defend their cause to the bitter end, no matter what anyone says. But their devotion is extremely stirring. A conversation with them usually lasts a long time with many boisterous interruptions and exclamations. Their optimism draws you into the discussion, and their excitement over the subject matter keeps you engaged. The only downside to this is that Mercury in Sagittarius gets so caught up in the moment they may not realize how far off topic they can get. While they have plenty of good ideas and good intentions, they sometimes stray from reality and delve into theories and mysteries of the universe. And though this is all well and good, it can be counterproductive during more serious conversations. It often means nothing gets done. But the Sagittarius Mercury people will be satisfied with the result either way. They don’t care whether or not others agree with them, as long as they feel they got their point across to their audience. But even that can be a challenge for Mercury in Sagittarius. They aren’t the most organized sign in the zodiac. They’re too busy rushing around, learning as many facts as possible to increase their wealth of knowledge. They stop for very little. This means they don’t soak up as much of what other people say. And, that can be frustrating for the person on the other end of the discussion. The Mercury in Sagittarius people don’t have time to absorb everything being said and done around them. This is why they always get right to the point. There are no mind games with this fire sign, only pure and honest facts, and examples. They dislike when others skip around the issue at hand. They have neither the time nor the attention span to deal with such folly. It’s not usually easy to upset them. But they will lose their patience if they feel you are not presenting the most important parts of a conversation promptly. But when it comes to fun and flirtatious subjects, there will be no one looking to have more of a good time than Mercury in Sagittarius. They adore playful banter and witty repartee. Anyone who can keep up with them is a winner in their book.